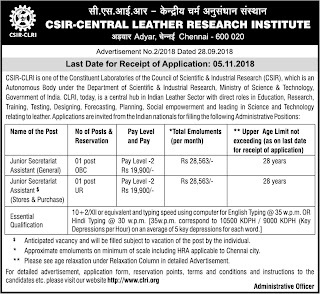 CLRI Chennai Junior Secretariat Assistant Recruitment 2018 2019 | CLRI Chennai invites Application for the post of 02 Junior Secretariat Assistant Posts. 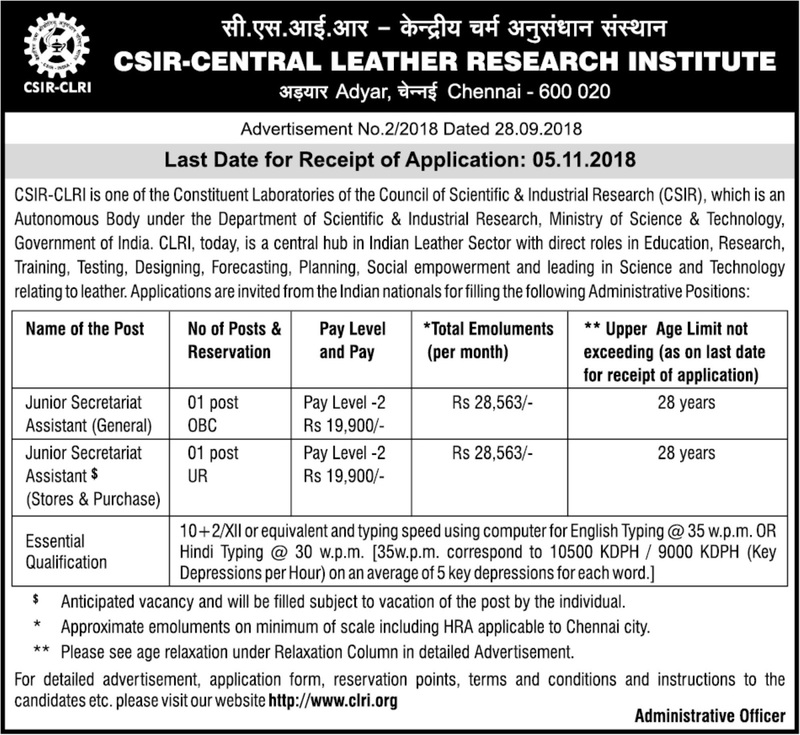 Aspirants Download Application Form through Official website www.clri.org | Opening Date and time for Submission of Application is 30.09.2018 and end up by 05.11.2018. You can check here CLRI Chennai Recruitment Eligibility Criteria, Pay Scale, Application Fee/Exam Fee, CLRI Chennai Selection Process, How to Apply, CLRI Chennai Syllabus, CLRI Chennai Question Paper, CLRI Chennai Admit Date Release Date, CLRI Chennai Exam Date, CLRI Chennai Result Release Date & other rules are given below.. Aspirants are requested to go through the latest CLRI Chennai job recruitment 2018 fully, before applying to this job. As per the recent CLRI Chennai notification 2018, the eligibility details like Educational Qualification & Age Limit for the Junior Secretariat Assistant job has given below. CLRI Chennai may follow the following process to select the candidates. The instructions for payment through SB Collect is available in CLRI website. How to apply CLRI Chennai Junior Secretariat Assistant Vacancy?